Mystery novelist Aki Akahori’s Inspector Takabe is like a Japanese Maigret, but her life is about to turn into a Mary Higgins Clark novel, except darker. 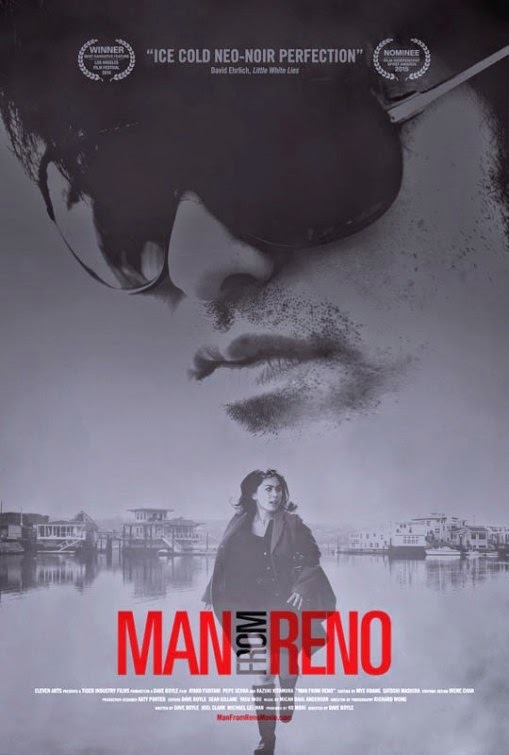 A chance encounter with a seductive stranger leads to more intrigue than Akahori bargained for in Dave Boyle’s Man from Reno (trailer here), the best narrative award winner at the 2014 L.A. Film Festival, which opens this Friday in New York. Although Takabe rules the Japanese bestseller lists, Akahori is uncomfortable with her success. Tired of her celebrity status, she deserts her publicity tour, taking refuge in San Francisco, where she once went to school. In her hotel, she meets a handsome Japanese tourist from Reno, or so she deduces. She did not have a tryst in mind, but she eventually yields to his charms. However, just when things start heating up, he precipitously vanishes. Even more disconcerting are the total strangers who suddenly want to take a quick look-see in her room for who-knows-what. Just north of town, Paul Del Moral, the sheriff of San Marco, is also searching for a Japanese man. In this case, it is the individual he accidentally hit during severe fog-in, who up and left the hospital in a suspiciously rash manner. Soon a dead body turns up in San Marco who seems to have some connection to the fellow Del Moral dubbed “Running Man.” Inevitably, Del Moral’s investigation will lead him to San Francisco and the increasingly uneasy Akahori. Reno represents a quantum step up for Boyle, whose previous films, like White on Rice, have been largely classifiable as romantic comedies. His frequent collaborator Hiroshi Watanabe is also back in the fold, but this time around he plays a strictly serious supporting role. Instead, Ayako Fujitani and veteran character actor Pepe Serna take star turns as Akahori and Del Moral, respectively. Expect to see more of them because they both make major statements with their smart, charismatic, yet understated performances. As thrillers go, Reno (co-written by Boyle, Joel Clark, and Michael Lerman) has several fresh twists and it nicely captures the between-worlds vibe of the expatriate lifestyle. Technically polished, Richard Wong’s evocatively noir cinematographer also heightens the tension during several key scenes. Murkier than one might expect, Reno is an effective somewhat romantic suspenser that never rushes to tip its hand. Yet, it even more appealing to see such a film anchored by people who look like Akahori and Del Moral. Granted, Fujitani is a beautiful woman, but in a mature, cerebral manner. Likewise, Serna is wonderfully grizzled, in a confidence-inspiring way. They are terrific, carrying the film relay-style during their many solo scenes. Highly recommended, Man from Reno opens this Friday (3/27) in New York, at the Regal E-Walk.